After quite a few months, I finally finished Howard Zinn's A People's History of the United States, all 670 something pages of it. This most recent volume goes through the election of 2000 and the beginning of the war on terror. 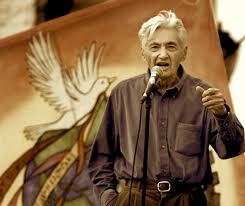 A People's History of the United States is a 1980 book by American historian and political scientist Howard Zinn. In the book, Zinn seeks to present American history through the eyes of the common people rather than political and economic elites. A People's History has been assigned as reading in many high schools and colleges across the United States. It has also resulted in a change in the focus of historical work, which now includes stories that previously were ignored. The book was a runner-up in 1980 for the National Book Award. It has been frequently revised, with the most recent edition covering events through 2005. In 2003, Zinn was awarded the Prix des Amis du Monde Diplomatique for the French version of this book, Une histoire populaire des États-Unis. More than two million copies have been sold. I loved reading this book. I didn't know that John Adams was the lawyer who successfully defended the British soldiers in the Boston Massacre. I didn't know that Lincoln questioned Polk's war on Mexico and the reasoning for sending US troops. From Columbus to Bush vs Gore, Zinn's version of history seems more plausible than the pablum most of us are fed. My history... describes the inspiring struggle of those who have fought slavery and racism (Frederick Douglass, William Lloyd Garrison, Fannie Lou Hamer, Bob Moses), of the labor organizers who have led strikes for the rights of working people (Big Bill Haywood, Mother Jones, César Chávez), of the socialists and others who have protested war and militarism (Eugene V. Debs, Helen Keller, the Rev. Daniel Berrigan, Cindy Sheehan). My hero is not Theodore Roosevelt, who loved war and congratulated a general after a massacre of Filipino villagers at the turn of the century, but Mark Twain, who denounced the massacre and satirized imperialism. I want young people to understand that ours is a beautiful country, but it has been taken over by men who have no respect for human rights or constitutional liberties. Our people are basically decent and caring, and our highest ideals are expressed in the Declaration of Independence, which says that all of us have an equal right to “life, liberty, and the pursuit of happiness.” The history of our country, I point out in my book, is a striving, against corporate robber barons and war makers, to make those ideals a reality — and all of us, of whatever age, can find immense satisfaction in becoming part of that. 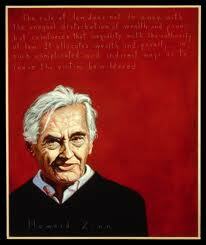 Not to long before Zinn passed, we saw him address a rather significant crowd, one that any historian would be jealous of. He was well into his 80s but his presentation was full of energy and the crowd loved it. No wonder so many historians like to take him apart a little. Very few historians become rock stars. Mr. Zinn was often taken to task for peeling back the rosy veneer of much of American history to reveal sordid realities that had remained hidden for too long. What was so radical about believing that workers should get a fair shake on the job, that corporations have too much power over our lives and much too much influence with the government, that wars are so murderously destructive that alternatives to warfare should be found, that blacks and other racial and ethnic minorities should have the same rights as whites, that the interests of powerful political leaders and corporate elites are not the same as those of ordinary people who are struggling from week to week to make ends meet? Let's talk about socialism. I think it's very important to bring back the idea of socialism into the national discussion to where it was at the turn of the [last] century before the Soviet Union gave it a bad name. Socialism had a good name in this country. Socialism had Eugene Debs. It had Clarence Darrow. It had Mother Jones. It had Emma Goldman. It had several million people reading socialist newspapers around the country. Socialism basically said, hey, let's have a kinder, gentler society. Let's share things. Let's have an economic system that produces things not because they're profitable for some corporation, but produces things that people need. People should not be retreating from the word socialism because you have to go beyond capitalism. In the 1960s, as a result of Zinn’s campaigning against the Vietnam War and his influence on Martin Luther King, the FBI designated Zinn a high security risk to the country, a category that allowed them to summarily arrest him if a state of emergency were to be declared. The FBI memos also show that they were concerned with Zinn’s repeated criticism of the FBI for failing to protect blacks against white mob violence. Zinn's daughter said she was not surprised by the files; "He always knew they had a file on him"
Zinn was swimming in a hotel pool when he died of an apparent heart attack in Santa Monica, on January 27, 2010. He had been scheduled to speak at the Santa Monica Museum of Art for an event titled "A Collection of Ideas... the People Speak." In one of his last interviews he said he'd like to be remembered "for introducing a different way of thinking about the world, about war, about human rights, about equality," and "for getting more people to realize that the power which rests so far in the hands of people with wealth and guns, that the power ultimately rests in people themselves and that they can use it. This morning, I was in a Taco line and a young woman had a T shirt that had a flag of the United States on the back of the shirt. The inscription read, Back to Back World War Champions. Howard would have been horrified.